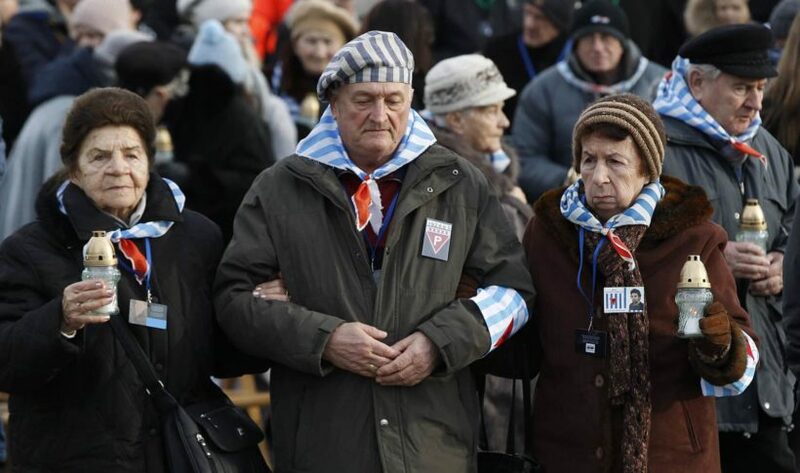 (Compiled from Euro News and by Francesca Paris, NPR) – On International Holocaust Remembrance Day on Sunday, a group of survivors, politicians and foreign dignitaries marked International Holocaust Remembrance Day in a ceremony at Auschwitz, that once housed the largest Nazi death camp. Dozens of former prisoners, priests and staff of the Auschwitz Memorial laid wreaths at the former German Nazi concentration and extermination camp to commemorate the 74th anniversary of the camp’s liberation, on January 27, 1945. They reunited at the so-called “wall of death” at Auschwitz Memorial’s Block 11, against which Nazis executed thousands of prisoners. The main commemoration event was held at the camp’s “central sauna,” where new inmates were stripped, had their heads shaved and were tattooed with a number on their arms by Nazis guards. Prayers and tributes were paid at the Monuments of the Victims. Polish president Andrzej Duda and Prime Minister Mateusz Morawiecki attended the ceremonies. 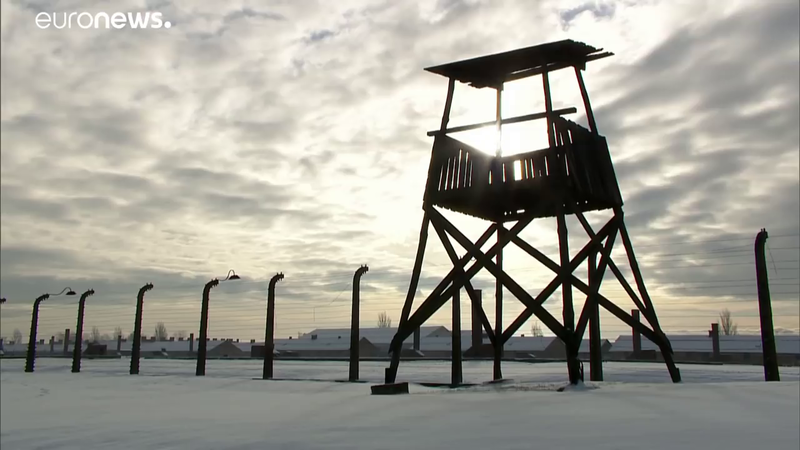 The Auschwitz Birkenau camp operated from 1940 until its liberation by the [Soviet] Red Army on January 27, 1945. Until the liberation, German Nazis murdered approximately 1.1 million people in Auschwitz, mostly Jews, but also Poles, the Roma, Soviet prisoners of war and people of other nationalities. The camp was declared a national memorial site in 1947. For the world today, Auschwitz is a symbol of the Holocaust and atrocities of Hitler during World War II. January 27 was adopted as the International Holocaust Victims Remembrance Day by the United Nations in 2005. According to the UN, the purpose of this is not only to remember the victims of the Holocaust but also to promote the education of the Holocaust throughout the world. On January 23, the European Union Parliament held a ceremony in Brussels to mark the upcoming International Holocaust Remembrance Day. European Parliament President Antonio Tajani of Italy, Prime Minister of Romania Viorica Dăncilă and Chair of the Jewish Agency Issac Herzog commemorated the victims of the Holocaust. “To remember these men and women — those who perished and those who survived — is to strive to prevent such suffering from happening again. Any denial or indifference to the horror of this chapter in the history of humankind diminishes all men and women everywhere and invites repetition of this great evil.”]. This year’s anniversary comes amid growing concern among survivors and world leaders alike that the Holocaust has begun to slip from international, collective memory — particularly among younger generations. In remarks both before and on the day of the anniversary, leaders also lamented recent spikes in hate-inspired violence. According to a poll released Sunday by The Holocaust Memorial Day Trust, five percent of adults in the United Kingdom don’t believe the Holocaust happened, and 64 percent either don’t know the number of Jews murdered or underestimate that number. In a recent op-ed for the newspaper Die Welt, Germany’s foreign affairs minister, Heiko Maas, wrote that with fewer people directly connected to the past, Germany must continue to teach its young people about the Holocaust. The UK Daily Mail reports that over the past year, Germany has seen a rising number of often violent attacks against Jews carried out by neo-Nazis and Muslims, prompting the government to appoint a commissioner against anti-Semitism and to start funding a national registration office for anti-Semitic hate crimes. In the United States, a poll from the Conference on Jewish Material Claims Against Germany conducted last year finds four out of 10 people don’t know what Auschwitz was. That proportion rises to two-thirds for millennials. In a more recent study, the Conference found that 52 percent of millennials in Canada cannot name even one concentration camp or ghetto and 62 percent of millennials did not know that 6 million Jews were killed in the Holocaust. Compiled from reports by Francesca Paris at NPR and from EuroNews on Jan. 27. Reprinted here for educational purposes only. May not be reproduced on other websites without permission. b) When was International Holocaust Remembrance Day established? c) What is the two-fold purpose of this day? d) Polls in the UK, US and Canada show that a large percentage of young people don’t know what Auschwitz was and don’t know how many Jewish people were murdered by Hitler. Even more concerning is the statistic that five percent of adults in the United Kingdom don’t believe the Holocaust happened. A poll by the Holocaust Memorial Day Trust found that 5% of British adults do not believe the Holocaust took place and one in 12 believes its scale has been exaggerated, a survey has found. In the survey, 45% of those polled said they did not know how many people were killed in the Holocaust, while one in five (19%) believed fewer than two million Jews were murdered. The actual figure was six million. His father, who helped hide Jews as part of the Dutch resistance, was arrested in Amsterdam and gassed at Auschwitz, in Nazi-occupied Poland, in January 1943. Mr Frank, who now lives in Hertfordshire, England said he was “surprised” by the number of people who do not believe the Holocaust took place. The 83-year-old said: “In my experience, people don’t have a solid understanding of what happened during the Holocaust and that’s one of the reasons I am so committed to sharing what happened to me. What do you think is the best way to inform/educate the world about the truth of the atrocities of the Holocaust? Be specific. Yom HaShoah (Holocaust Remembrance Day) is observed as Israel’s day of commemoration for the approximately six million Jews who perished in the Holocaust as a result of the actions carried out by Nazi Germany. In Israel, it is a national memorial day. It was inaugurated in 1953. It is held on the 27th of Nisan (April/May). The date relates both to the Warsaw Ghetto Uprising which began 13 days earlier, and to the Israeli Independence Day which is eight days later. The Polish Institute of National Remembrance (IPN) said that Poland had been in the past many times presented as an ally of Hitler, which made it necessary to protect its reputation. Poland lost about 3 million of its non-Jewish citizens, including many of its intellectuals and members of the elites during World War Two. The capital Warsaw was razed to the ground in 1944 after a failed uprising in which 200,000 civilians died. For the U.S. Holocaust Memorial Museum in Washington D.C., go to ushmm.org.